The Chakras are energetic spheres that are found aligned in our bodies along the center line from the tailbone to the crown. They’ve been recognized for over a millennia in India, and may have formed the earliest acupuncture meridian grid bases. 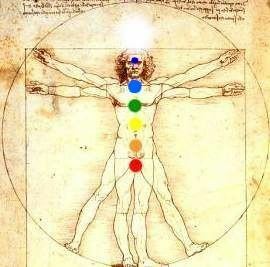 Each of the 7 chakras are places where we store ‘power’; our personal life force, otherwise known as ‘chi’ energy. When we’re feeling well and life seems to flow along for us, the chakras are open and energy is spinning through as it should. If we get ill, say a sore throat, for example, it is believed that the throat chakra has been suffered stress~ most likely having been restricted by feelings of blocked expression or feeling overly censored, whether by society or oneself. This creates tension and allows germs to settle in and wreck havoc. IMO colds can be averted by staying happy and by holding one’s power, as well as eating nourishing foods, drinking plenty of clean water, getting enough rest and practicing good personal hygiene. If we are ‘misaligned’ by emotional upset or physical crisis it can lead to increased ill health and longer recovery times. That’s a good reason to try and manage our emotional life and the stimuli that enters our psyche. Have you noticed that some people can be in the midst of an outbreak of flu and not be affected, while others get sick frequently? Our immune systems function best when our bio-electromagnetic energies are flowing well. Deep breathing and gentle exercise can help keep this flow going. This effect of ‘energy flow’ has been proven in trees as well; if a tree is stressed by environmental factors, like drought or root damage, it sends out signals, somewhat like our hormones, that says, “I’ve been injured”. Insects pick up on this message and start attacking damaged trees, leaving healthy ones to thrive. So insects act as wolves do on herd animals – and only attack those ‘open to infestation’. Exercises like Tai chi or Qi gong slowly move this internal energy through our bodies which helps us stay ‘in the flow’. I can personally attest to the fact that these easy, gentle movements unwind tension and allow ‘stuck’ emotions to flow out of oneself so that healing can occur on many levels; physical, mental and emotional. It actually allows negativity to leave ones body so that whatever you focus on, that is positive, may enter that vacuum. Of course, you have to consciously put positive intentions back into your body via positive thoughts, or habitual worry and doubt will return. 1 Root Chakra– located at the base of the spine, this chakra is pictured as red; the color of survival, basic instincts, fight/flight reactions, and is related to the adrenal glands, large intestines, kidneys and digestive system. 2 Sacral Chakra– located at the reproductive organs, pictured as orange; the color of sexuality, sensuality and human relations and is related to the reproductive hormones, bladder and kidneys. 3 Solar Plexus Chakra– located in the belly, near the naval, is pictured as yellow; the color of personal power and intent, is paired with the pancreas, liver, gall bladder, stomach, small intestine and spleen. 4 Heart Chakra– located under the sternum in the center of the chest, is pictured as green; the color of growth, compassion and healing, and is tied into the thymus gland, and heart. 5 Throat Chakra– located near the adams apple, is pictured as blue; the color of self expression, emotion and interpersonal dynamics, and is tied into the thyroid and parathyroid glands, which control growth and many other glands, and lungs. 6 Third Eye Chakra– aka Anja, is located between the brows, is pictured as indigo; the color of psychic energy and intuition and is connected to the pineal gland, the brain and face. 7 Crown Chakra– located at the top of the head, where the skull plates intersect is pictured as white and sometimes purple; the color of holiness, royalty and purity and is our connection to Source/All that Is/Higher Self. It is connected with the pituitary, our Master gland, which controls autonomic functions as breathing and heartbeat. There are actually more chakras found above one’s crown, but they are engaged in higher spiritual states than the mundane reality most of us know. The 8th Chakra is sometimes arrived at and energized in mystic union with another via Kundalini yoga and the 9th Chakra is aka Nirvana, is activated briefly as a state of Unity with All that Is. Posted in Chakras and Healing by kalin on August 19th, 2012 at 11:55 pm.